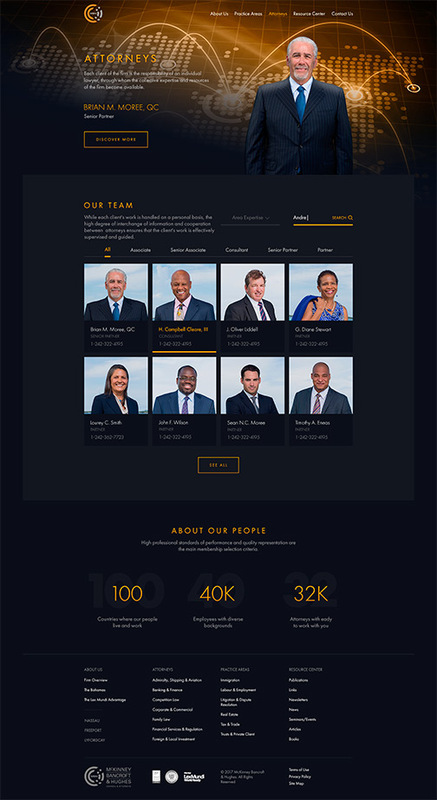 McKINNEY, BANCROFT & HUGHES is one of the largest and oldest firms in The Bahamas and conducts an extensive international and domestic practice from its offices in the cities of Nassau and Freeport. Founded principally as a corporate and commercial firm, today McKinney, Bancroft & Hughes is engaged in the general practice of law and services its clientele through the expertise of its attorneys in over 35 practice areas. 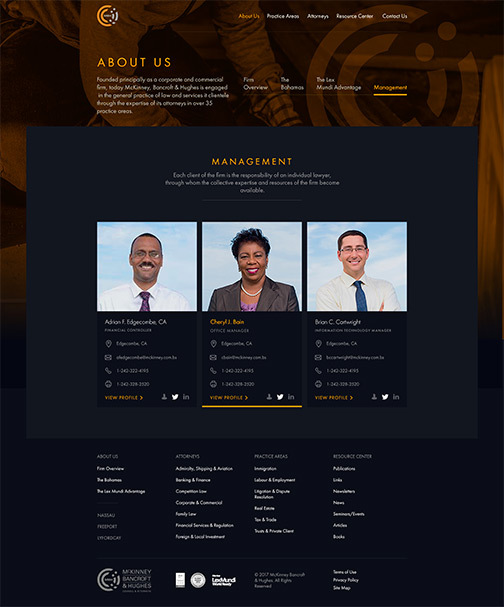 Our creative team has used a modern, well organized and intuitive design. 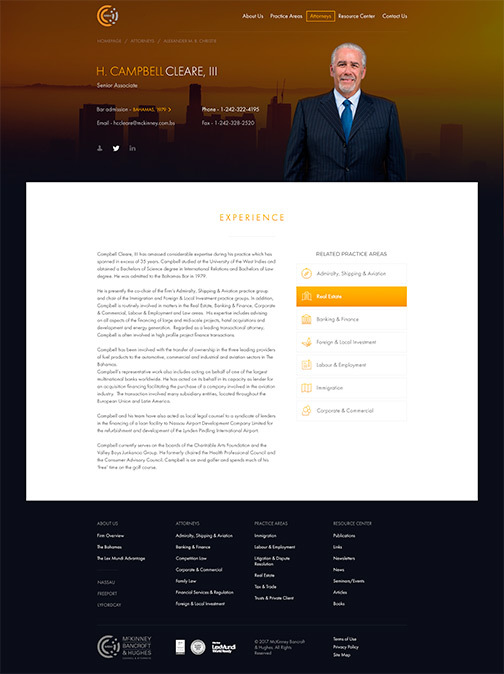 For style guide, we have used Shark and Orange Yellow from the color palette to make it look professional. The most important steps in the design process. Elements that together make up the interface, including layout, visual design, brand and interaction. UI is to facilitate user’s interaction as simple and efficient as possible in term of accomplishing user goal. We made use of good graphical design to support usability and influence how users perform interactions. Every page emphasizes clarity and simplicity – it is designed to show to the client how easy it is to use and take advantage of the offered services, and moreover, how to further turn this into a valuable customer reaching tool. 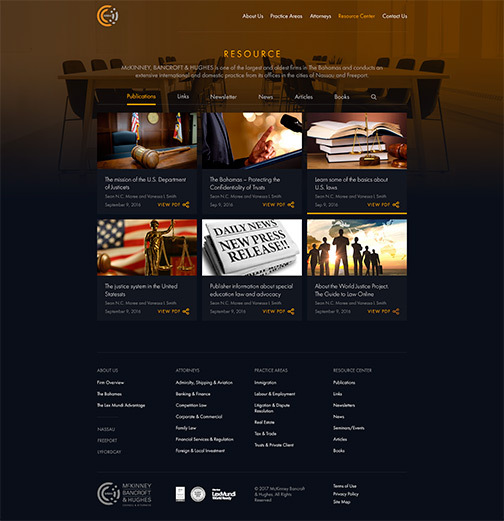 Each client of McKinney, Bancroft & Hughes company is the responsibility of an individual lawyer, through whom the collective expertise and resources of the firm become available. McKinney, Bancroft & Hughes is able to respond to requirements for legal services throughout the markets of the world and virtually every country. High professional standards of performance and quality representation are the main membership selection criteria.